"The highest Club Med in the Paradiski, La Plagne 2100 gives you ski-in-ski out access to a magnificent resort. The property is good value for a Club Med, but those looking for cutting age design or luxury accommodation are better off at Club Med Peisey Vallandry at the other side of the valley. 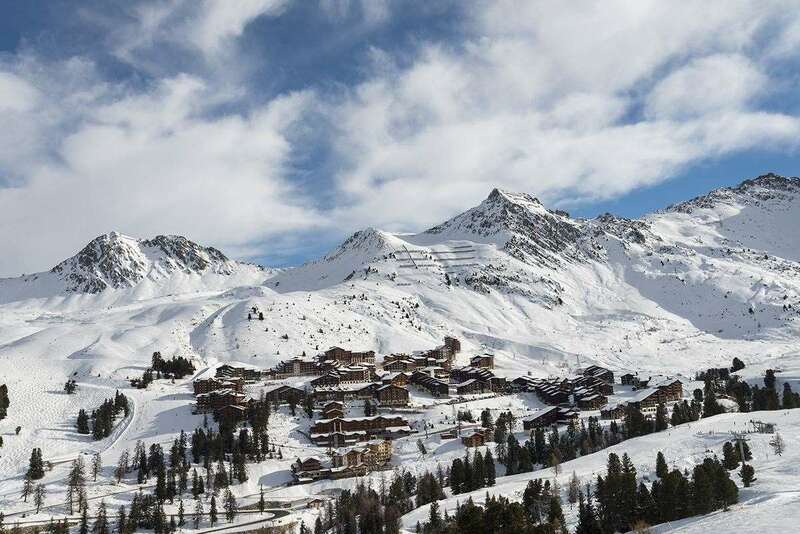 Nonetheless, if you are looking for an all-inclusive holiday that includes your lift pass and excellent food, the Club Med La Plagne 2100 is a good choice. " WA Resort with 326 rooms in a 12 floor hotel, with a façade in a harmonious blend of wood and metal. Standard Room - A comfortable and elegant Standard Room, available with connecting rooms. Additional options include a "Piste" or "Mont Blanc" View. All including Bathroom, Coffee machine, European electrical plugs / 220 Volts, Flat-screen television, Hair-dryer, Heated towel rail, Security safe(s) and Telephone. Deluxe Room- A spacious Deluxe room, offering a generous level of comfort in an elegant atmosphere. Situated on the 10th, 11th & 12th floors. All including Bathroom, European electrical plugs / 220 Volts, Flat-screen television, Hair-dryer, Heated towel rail Ironing kit, Minibar, Security safe(s), Tea and coffee kit and Telephone. Suites- A spacious and elegant Suite facing the valley, with a furnished terrace, where you can savour a luxury standard of comfort. All including Bathroom (with bathtub and shower), Coffee machine, European electrical plugs / 220 Volts, Flat-screen television, Hair-dryer, Ironing kit, Kettle, Mini-fridge, MP3 player, Radio / CD, Security safe(s) and Telephone. Overall, it was excellent and met our expectations. Straightforward flight, transfer and greeted immediately at the taxi upon arrival at the hotel, and whisked away to our rooms with our luggage waiting at our room doors. The rooms were truly small and compact but well decorated and clean. Beds were twinned put together not double. We were delighted with the range of choice for breakfasts, lunches and dinners and there were plenty to delight us. We tried the speciality restaurant one evening which was table service but felt that the buffet choices was much better. Afternoon tea selection caters more for the kids, but quite frankly with 3 big meals a day, we did not need much else. The only disappointment was departure day at 4.00am. We were expecting a takeaway breakfast bag but was advised that a full breakfast would be laid out for us. This did not materialise. The hotel decor is not to my taste but well maintained. All the public area were on the ground and first floor and the ski room opens up to the pistes with drinks and grappe served every morning. The bar menu was extensive with cocktails, cognac, and ports included. The bar was not sufficiently manned and there is a wait to be served. It would be better if the bar is for adults only. The area is open-plan with stage and dance floor, and there were always kids running around. Hot drinks were available all day from the self service machines. Big minus was that Nescafe Coffee was served. I like my coffee but found the machine coffee undrinkable; NOT four star hotel standard. The tea selection was not much better either. We paid over &#163;100 for our ski hire, which was more expensive than the ski hire shops but the choice and service was not as good. The skis given to us on the first day were not waxed and burred. It is obvious the skis returned at the end of each week were simply put back on the racks. As the conditions were icy, we struggled the first day and had to take our skis back to be serviced. The ski school has an office in Club Med and we only need to meet outside the hotel. The all day ski lessons were ski guiding/ lessons and were quite relaxed as we preferred. More instructions would be offered if requested for sure. The lessons were for 5 days and we enjoyed a free day on the last day. We went to Les Arcs one day with the instructor but that was not very successful as strong winds closed the glacier, unfortunately. Customer service was top class and the reception was excellent always. There were some evening show entertainment but abit “hit and miss”. These were performed by the hotel staff. Kids were particularly well catered for. Surprising there wasn’t a swimming pool in such a big hotel. La Plange Ski Area: We were ski guided so we only needed to follow. Due to the poor snow most of the black runs and half the red runs were closed. However we still have had a very good week and skied in different areas each day and enjoyed some good long runs. We did not ski much below 1800m so on a good snow week there will be even more to explore. It took slightly over an hour to get to the top of the glacier from La Plagne 2100. The cable car was old and slow. We did not stay here for long this week as there were limited ski-ing. The hearts of the area are Plagne Bellecote and Plagne Centre, making it very easy to get around and get home. This is a ski area with alot of good ski-ing to be experienced. Les Arcs is much smaller but we enjoyed good snow condition when we were there. It took an hour to get across but I did not time how long it took to get to the other end of Les Arc. Unfortunately we did not get to ski the famous Aguille Rouge as the glacier was closed due to strong winds. It is always hard to get the best of a neighbouring area as it takes time to get there and you get to set for home soon after lunch. We went to La Plagne during the first week of April 2013 when there was tonnes of snow despite the time of year. The Club Med hotel (as the rest of the resort) is no beauty to look out. But it is on the piste - so a good ski in/ski out location (albeit at the end of La Plagne, which is rather a linear resort). The hotel is perfectly smart enough inside with the bedrooms/bathrooms being smarter than the common areas. Cleanliness is excellent. The real 'plus' are the staff and service. The former being very friendly; the latter being excellent. The food is consistently good, the inclusive wine decent enough, and the bar well stocked. For those with children, there is plenty to entertain them. The kids club runs from 8.30am until 5pm, and the Club Med staff organise putting on ski boots, getting them to/from lessons, etc - which makes it a lot easier in the mornings. If you are a fan of 'theatre', the staff put on a show every night. This takes place in the main bar area, so it's a little harder to find peace and quiet post dinner if that's your preference. Altogether, a very good holiday. I would go back.